Now the Chips are Down | D.A.R.E. 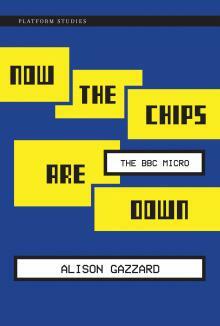 This new book by DARE’s Alison Gazzard, coming soon from MIT Press’s Platform Studies series, explores the history of the BBC micro and its relation to gaming cultures of the 1980s. Gazzard looks at games developed for the BBC Micro, including Granny’s Garden, an educational game for primary schools, and Elite, the seminal space-trading game. She considers the shift in focus from hardware to peripherals, describing the Teletext Adapter as an early model for software distribution and the Domesday Project (which combined texts, video, and still photographs) as a hypermedia-like experience. Gazzard’s account shows the BBC Micro not only as a vehicle for various literacies but also as a user-oriented machine that pushed the boundaries of what could be achieved in order to produce something completely new.